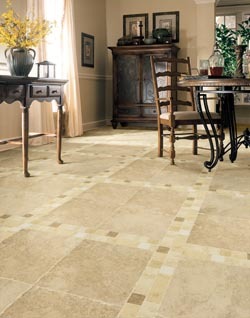 Change the mood and atmosphere in your home by installing ceramic tile floors. At our flooring store, we offer a large selection of stylish and affordable ceramic tile flooring products that give your home wall-to-wall appeal. In fact, we’ll “floor you” with our selections! Because we carry so many different colors and styles, you’re sure to find the perfect floor to meet your needs as well as your budget. Bring a fresh, new look to your rooms. One of the most dramatic ways to enhance the ambiance in your home or business is to install ceramic floor tiles. Ceramic is a versatile and stylish flooring product that lasts longer than a lifetime. In fact, this enduring flooring product has been used by builders for many hundreds of years. We have a virtually endless selection of flooring options at our store. If you cannot locate what you want, one of our friendly sales professionals will be happy to assist you. Whether you want to lay ceramic tile flooring in your bathroom, kitchen, living room, or bedroom, we guarantee that you’ll find a style that matches your home décor. If it’s not at our store, we’ll locate your perfect choice for you. Ceramic is a durable, affordable, and completely customizable choice for floors. A tile floor made of ceramic is not simply strong but exceptionally beautiful. Make your home more stylish with ceramic floors. At our store, we guarantee you’ll find top-quality floors at the lowest prices around. So, you get the best of both worlds – value and affordability – which is something you may not find at other flooring stores. In addition, we’ll help you select the best floor for your project and budget. Simply choose your floor, and we’ll take it from here! We are more than a flooring warehouse. At the same time, we are experts at flooring installation. The reason? We care about the products we sell and the satisfaction of our customers. After all, ceramic tile floors that are not properly installed will begin to have problems in the future, such as buckling, bulging, and other damage. When you choose us for installation services, we ensure you have a worry-free experience, but most importantly – beautiful floors! Our experienced flooring professionals handle projects of all sizes and scopes. We are so confident you’ll be satisfied with your new floor that we offer an Ultimate Confidence Guarantee. If you're not happy with your new floor within 30 days after installation, we will replace it with a floor of equal or lesser value. Contact us for more information about our Ultimate Confidence Guarantee on your new floor. We proudly serve customers in Decatur, Forsyth, Mt. Zion, Macon, and Solomon, Illinois.